ï»¿Monarch caterpillars dine exclusively on milkweed leaves. Monarch butterfly populations are in serious decline in the U.S., but it’s not too late to reverse this devastating trend. According to butterfly expert Dr. John Pleasants from Iowa State University, there are simple things we can do to mitigate the loss of monarchs and other pollinators. Iowa State University is part of a larger consortium of concerned researchers, educators, state agencies, conservation groups, and farmers working to help re-establish monarch butterfly populations. “Monarch population has decreased over the last decade by 90 percent,” says Dr. Pleasants, ISU assistant adjunct professor of ecology. “The main reason,” he explains, “is a decrease in milkweed.” Loss of summer breeding habitat and overwintering sites, as well as pesticide use, contribute to the problem. Dr. Pleasants says it’s imperative that we “get all hands on deck.” Bringing the monarch population back up to sustainable levels will require the concerted efforts of people from all walks of life. “We’ve lost a tremendous number of milkweeds,” says Dr. Pleasants. “To bring them back will take a while.” Milkweed plantings throughout the state and the Midwest, in gardens, ornamental plantings, along roadsides, and in farms, will help support monarch population growth. Plantings do not require a lot of space. 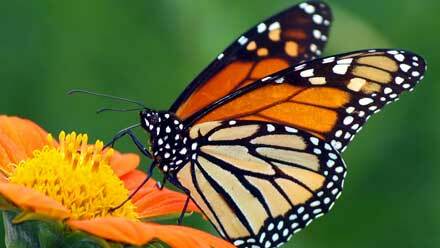 The Iowa Monarch Conservation Consortium hopes to connect urban and rural communities to ensure that monarch butterflies remain part of Iowa’s ecosystem. It’s developing a list of milkweed and other pollinatorfriendly species that concerned gardeners could plant. Milkweed is vital to the monarch life-cycle. Monarchs lay their eggs on milkweed, and the larvae eat only milkweed. Adult monarchs consume flower nectar, water, and fruit juice, and are particularly fond of bananas, oranges, and watermelon. There are many different species of milkweed. Dr. Pleasants says ISU researchers are determining whether certain species of milkweed are more attractive to monarchs than others, and what companion plants help milkweed thrive. ISU is committed to researching and developing cost-effective methods to establish and maintain productive monarch habitats in both rural and urban settings. Monarchs reside in the Midwest during the summer. Adults in the summer live only three to four weeks, so several generations are produced. Monarchs born in the last generation in the Midwest fly to Mexico in September, then overwinter in Mexico from November until early March, when they fly to Texas to lay eggs. The offspring from this generation fly back to the Midwest, arriving in late May. ISU is applying the best available science towards improving the monarch’s reproductive success. With enough community involvement, we can “get the population up to a level that’s sustainable,” Dr. Pleasants concludes.